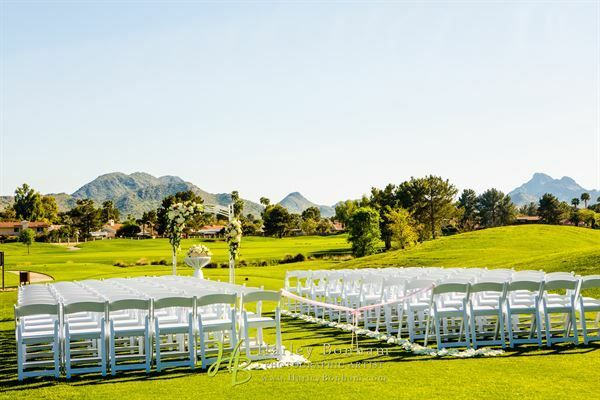 From our unrivaled setting in the shadows of the Squaw Peak Mountains to our renowned amenities and impeccable service, Stonecreek Golf Club offers an unequaled locale for extraordinary weddings and superlative special events. Our variety of elegant banquet and meeting rooms can accommodate up to 200 guests, while our emerald green golf course and lovely grounds offer ample opportunities for picturesque party functions, wedding ceremonies, meetings and unforgettable outdoor receptions under the stars. Let our friendly, experienced event specialists create a one-of-a-kind event that complements your personal style, fits within your budget, and leaves you and your guests with memories to last a lifetime. Includes: • Bride and Groom Dressing Rooms (Up to two hours prior to start of ceremony- $50 per every additional hour) • Ceremony Rehearsal • White Arch and White Padded Folding Chairs • DJ Table, Ceremony Table & Gift Table • Onsite Wedding Coordinator for Rehearsal and Ceremony • Access for Pictures on the Golf Course with Golf Carts (Up to four carts) Up to 100 guests Please see attached PDF for additional information. 5 Hour Rental Includes: • 60 in. Round Banquet Tables • White Padded Folding Chairs • 15 ft. x 15 ft. Dance Floor • Basic Linens, Napkins, Tableware, and Stonecreek Centerpieces • A Full Service Staff *Based on 100 Guests June - August | $1,750 September - May | $2,000 Please see attached PDF for additional information and menu options. Enjoy the wonderful weather we have in Arizona with your event in our Outside Covered Pavilion. Need a small room for a private event, breakfast or lunch meeting, Birthday Party or Rehearsal Dinner? We have a prefect room for you. Enjoy and Event inside our Grill. Great for a Reception, Dinner Party, Birthday Party, Bar Mitzvah or Bat Mitzvah, Schools and Sports Banquets, Weddings / Rehearsal Dinners or Memorial Service for a loved one, and more. Designed by renowned architect Arthur Hills, this desert links style course was named for the stone “creek” hazard that comes into play on fifteen holes. This Par 71 layout features beautiful, rolling fairways and stunning mountain views. Stonecreek Golf Club offers a challenging and fun golf experience for players of all calibers. Special Features: We have a spectacular Outdoor Pavilion right off our Restaurant Grill, a small Private Dining Room, we even rent out our Grill for private events, our Ceremony Site is located on the Golf Course and we have fantastic photo opportunities.